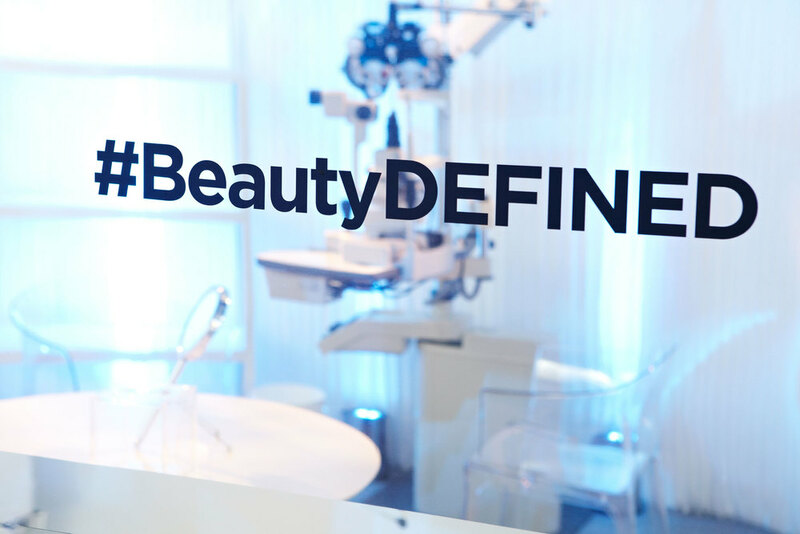 This contact lens maker, a division of Johnson & Johnson, approached us in 2014 to help position its newest product, Acuvue Define, as a beauty item. These prescription contact lenses enhance eye color and amplify contrast to make the wearer’s eyes stand out. Cafiero Lussier took a venue in downtown Manhattan and turned it into a design atelier, complete with an inspiration board filled with fabrics, textures and images In a lounge area, editors could sit down and speak directly with Acuvue brand manager and flip through additional information loaded into iPads. In an adjoining space, three optometrists were on hand with all the necessary equipment to fit editors with the lenses, and makeup artists created palettes for the editors that accentuated their coloring. Within several weeks, stories appeared about Acuvue Define in Allure magazine, The Gloss blog as well as other outlets. 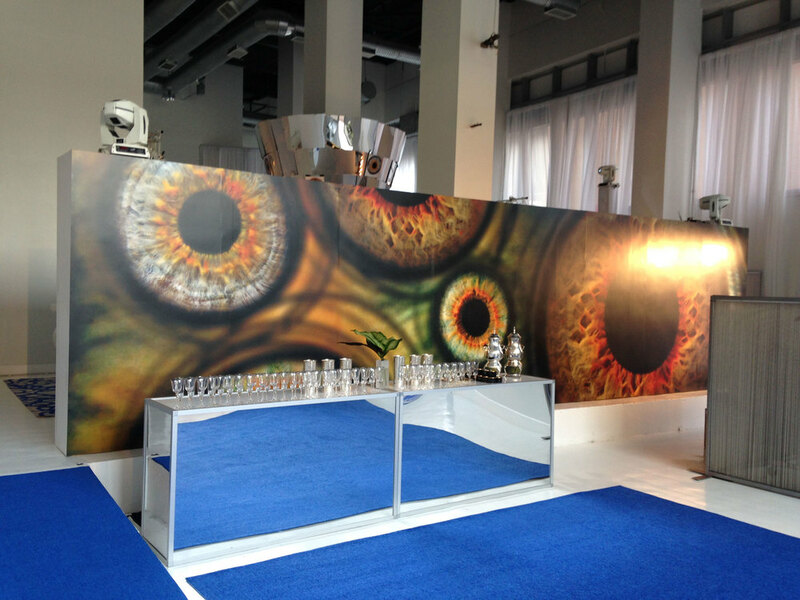 8’Tall x 32’Wide custom constructed wall to divide venue space with vinyl adhesive digital print of custom graphic. Glassware chosen to echo the Limbal Ring themed event. Welcome lounge for intimate remarks by brands spokesperson. Design atelier with iPads loaded with custom content. 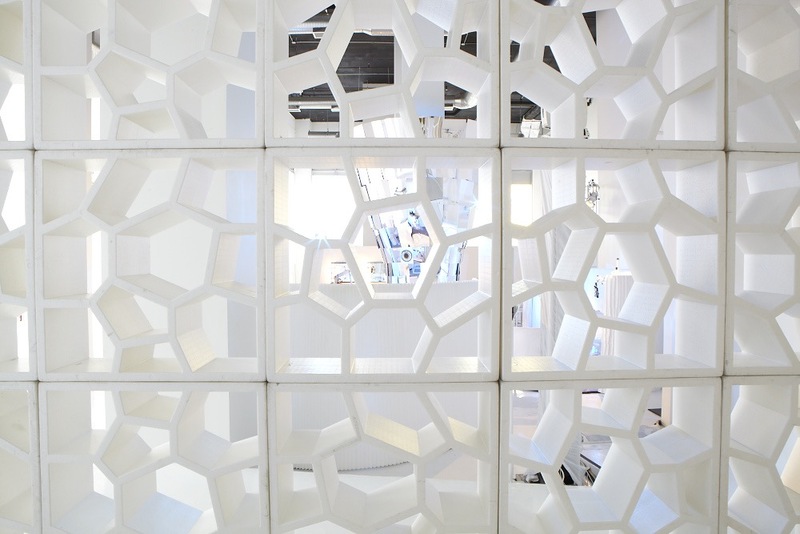 Mirrored hub designed to fit around existing column and includes custom shelf. When P&G Beauty acquired Vidal Sassoon, its new owners wanted to make it clear that they understood the history of the hair care firm, founded by the hairdresser who created the cutting edge looks of the 1960s and decades beyond. The client wanted to use 40-plus years of pictures to tell the story of the company and its founder. 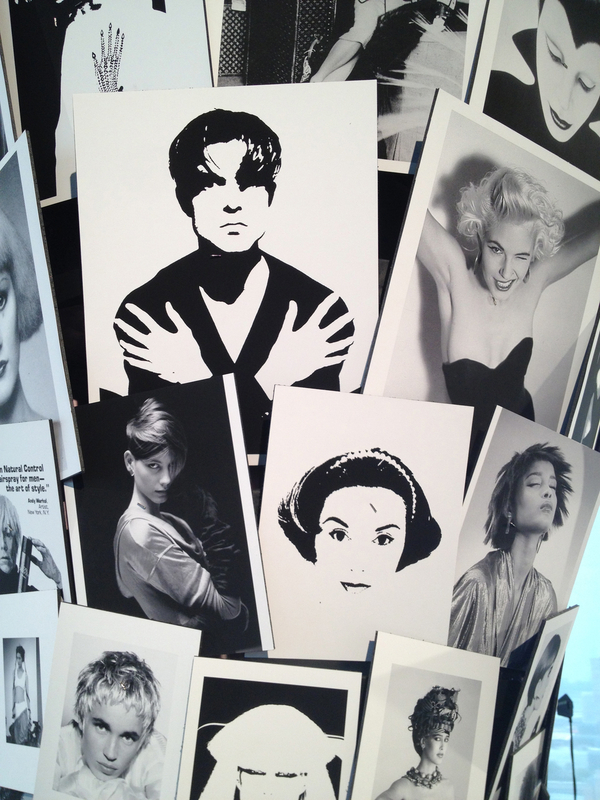 So we delved into the photo archives, scanning, printing and mounting more than 400 images to create “Decades of Vidal,” a pictorial timeline of the Vidal’s ground breaking hairstyles that blanketed the walls and columns of our chosen venue, The Glasshouses. And because hair products must be seen on hair, we also hired a team to produce historic Vidal Sassoon looks on models and partnered with Cameron Silver, the founder of the vintage clothing boutique Decades, who styled the models in the appropriate couture clothing. Entrance point of view and model box. Decades of Vidal image vortex (one of 2). Detail of scanned, modified, and printed images from VS archive. Technical spec drawing for “VS Image Vortex”. EIMI (which means “I am” in Greek,) is a Wella Professional suite of styling products targeted at the consumer market. We were tasked with introducing EIMI and producing events aimed at attracting the attention of long lead and short lead media. Playing off of Wella’s long commitment to the hair styling industry, we created a “Backstage at Fashion Week” event, where editors were escorted through a bustling hub of hair styling of the kind that goes on during Fashion Week. We created an immersion experience that provided the client with compelling stage to tell their product story. 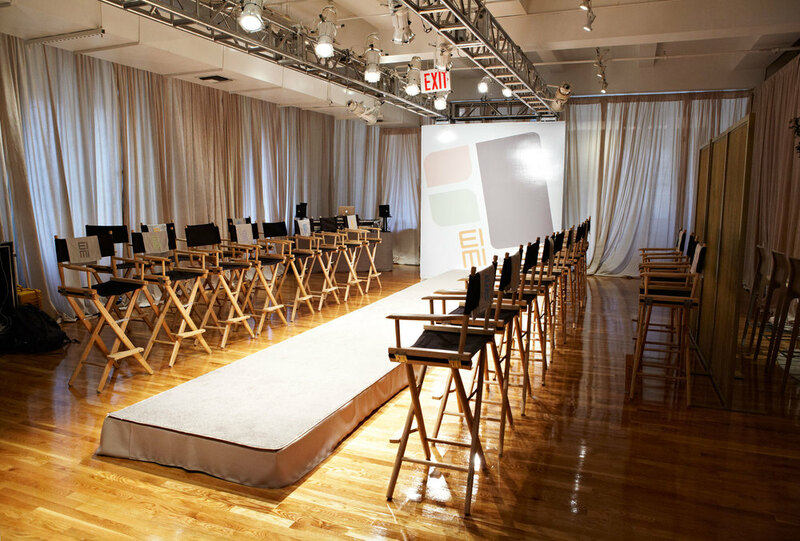 We also created a quieter, more intimate setting where editors could talk shop with Wella professional experts about their use of products on the models. And we hired graffiti artists to create a singular canvas composed of editor responses to the fill in the blank “I am?” Instagram Posts for the event. 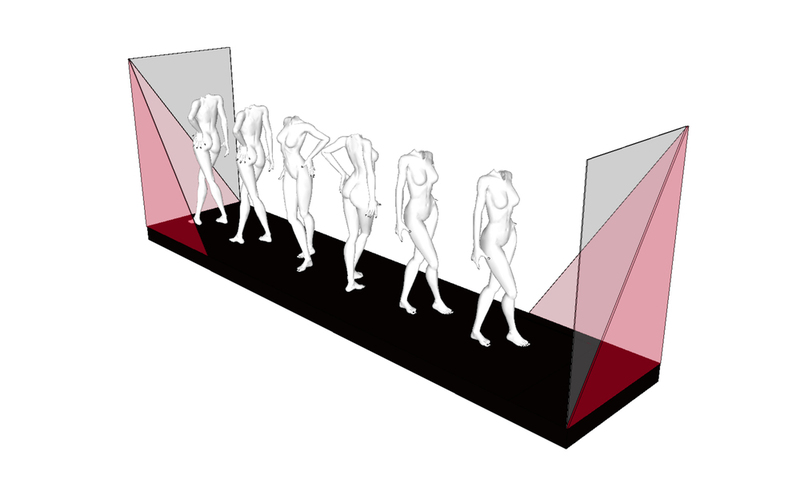 "Backstage & Fashion Week” entrance vignette, illustration. "Backstage & Fashion Week” entrance vignette, execution. 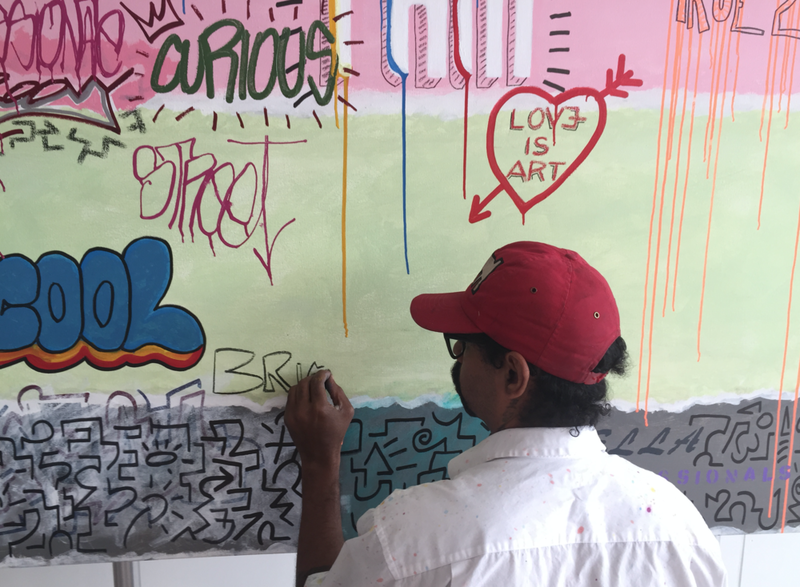 Artist Dave Ortiz working on “I am…” canvas. 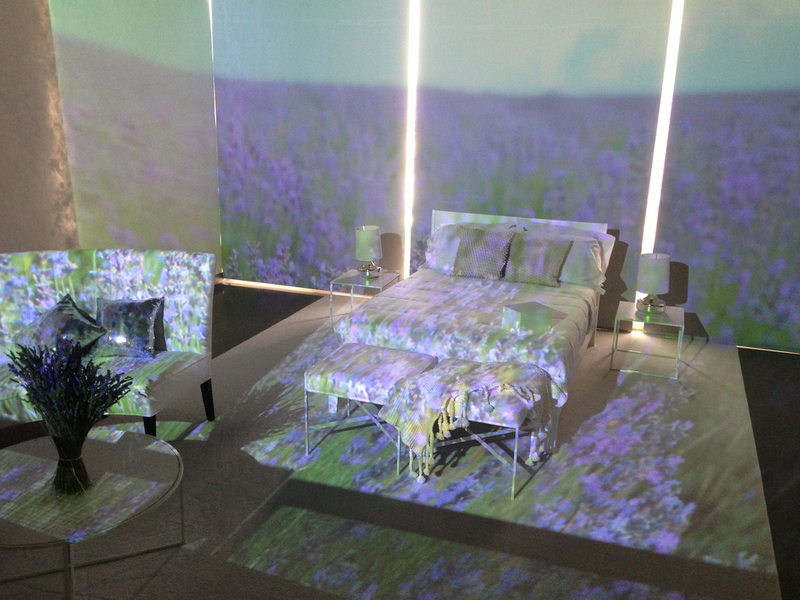 In order to set the stage for the launch of Febreze Bedroom Mist, we took a page from the advertising campaign, where print and television ads showed a bedroom transforming into a field of lavender in the south of France. 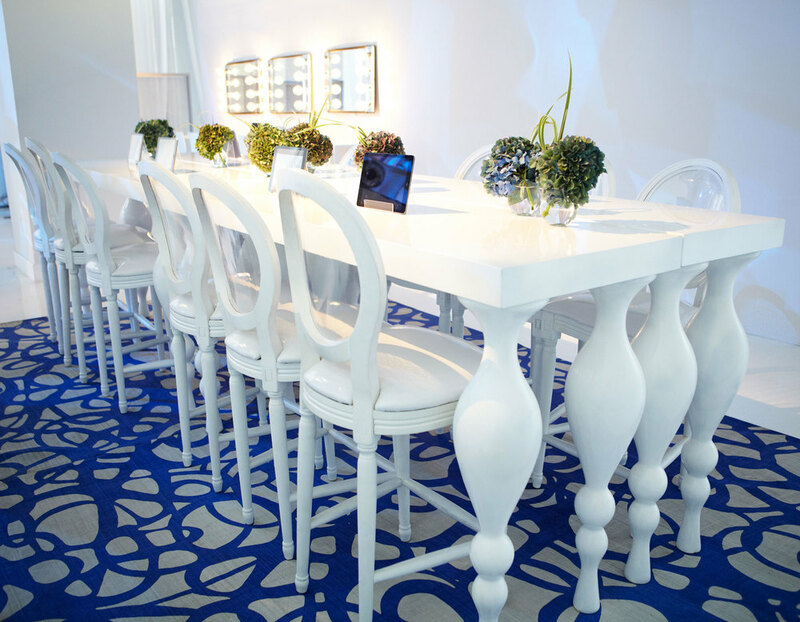 In a New York City event space we created a uniformly white environment, from the reception space to three distinct bedroom sets dressed entirely in white. Once the product was been introduced, blackout shades descended to block the daylight and 10,000 lumens digital projectors came to life, enveloping each bedroom with video content coordinating with each of the three scents: Lavender, Jasmine, Milk & Honey. In order to prevent a riot of different smells, we placed white linen napkins daubed with each distinct fragrance into airtight boxes and handed them to the editors as they entered the appropriate room. Fields of lavender bedroom vignette. Passed hors d’oeuvre: vegetable summer roll. When P&G Beauty acquired the Frédéric Fekkai hair care brand in 2008, the message was luxury, luxury, luxury. Nothing about the high-end products would change, and the hairstylist to the stars was happy to say so. 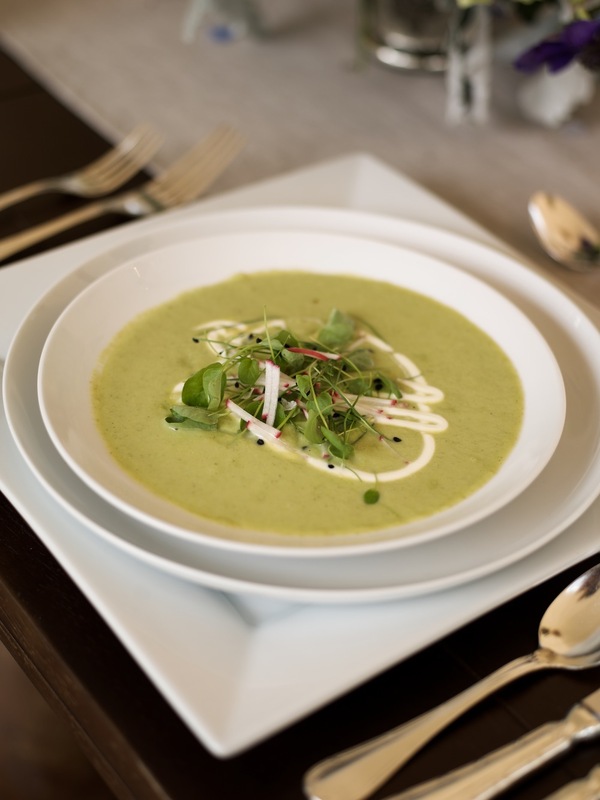 Frédéric has a 150-acre farm 80 miles north of New York City that epitomizes the tasteful balance of style and ease that the brand wanted to convey. What better way to illustrate that than hosting a lawn party there in lavish style? Helicopters were chartered and editors were whisked from New York City to the north field of his estate. 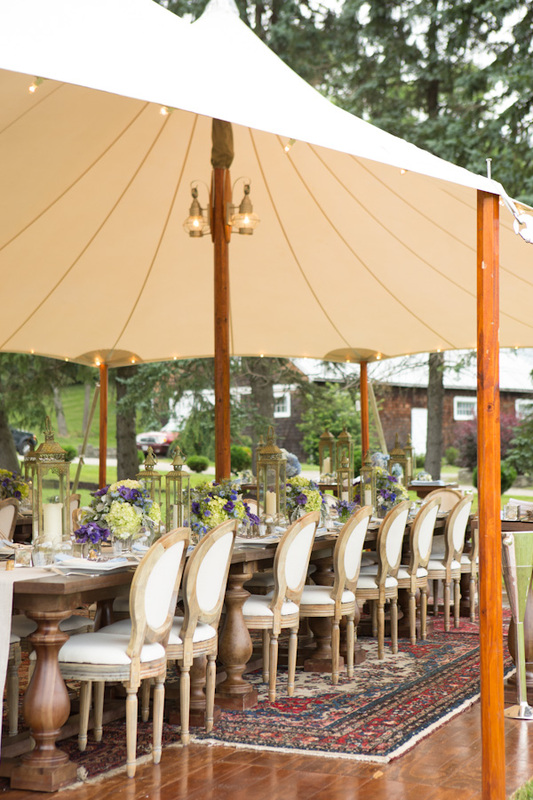 There, maharaja style tents layered with oriental carpets welcomed the guests for a Provençal-inspired dinner, hosted by Frédéric himself. Menu card detailing Provencal inspired, mid summer meal. Long shot of installed tent.